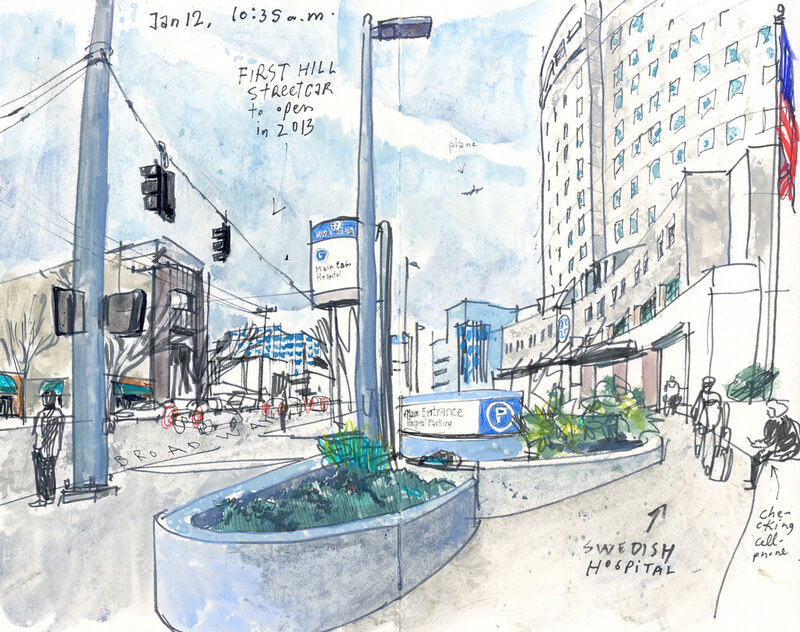 This morning I walked around Broadway Avenue and Madison Street near Swedish Medical Center and imagined the First Hill streetcar running through the neighborhood as I sketched this view. As with many city projects, there’s a little budget for art along the new line. But not for a sculpture or an interactive art piece similar to the Cheshiahud Loop’s project. The options mentioned in the call for artists include treatments for platform surfaces, adjacent sidewalks and other structures associated with the streetcar. I asked several people outside Swedish what they thought of the project. Jeremy McGrath, a physician assistant who just moved here with his family from Illinois, said people will be more likely to ride the streetcar if there’s beautiful artwork at the stops. “It adds to the quality of the city,” he said. McGrath also likes the idea of the streetcar as an alternative for people driving to Swedish. He said it will reduce people’s anxiety of having to find a parking space when coming to the doctor. The three years since I moved here have gone by fast. Before I know it, I’ll probably be back at First Hill riding the streetcar and enjoying the artwork now being discussed. For more information about the call for artists visit seattle.gov/arts.